Anything that blocks Lincoln Towers from public view is a giant​ gift to the city. Yikes, that is a really ugly building. Handel can do much better work than this, such as Millennium Place in Boston. 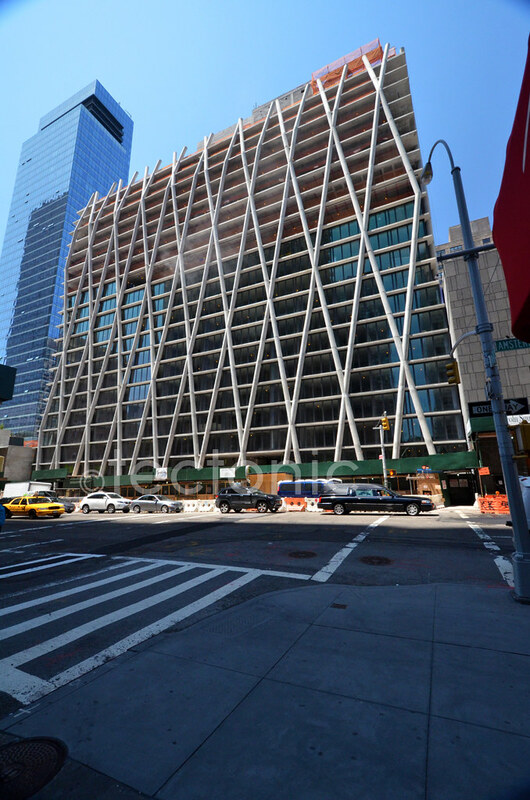 Maybe this design would look better on a larger building? Strongly agree -- loving how this came out! It looks stumpy in person. It needs to be at least ten floors taller. Very striking. One of the least underappreciated developments this year. did you actually mean "least" (as in a sarcastic way) or should it read "most" under appreciated ....as this building deserves more attention than it has received? Oops, you're right. I meant it is very underappreciated. 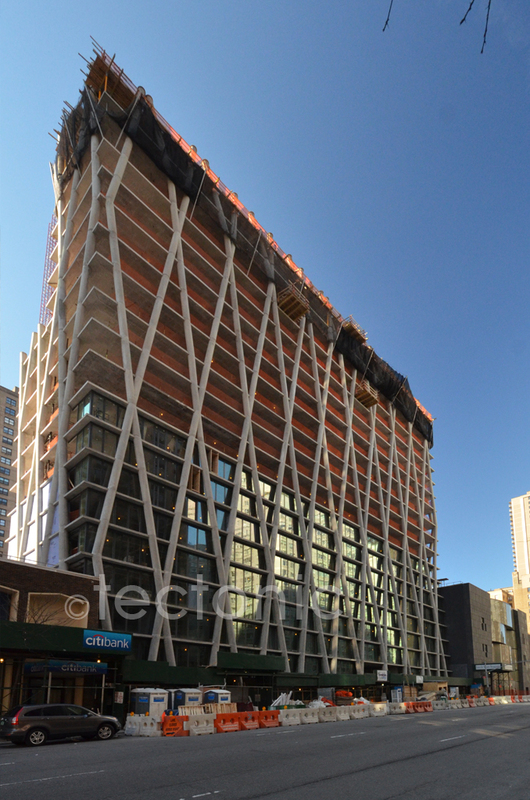 Final touches are being added to the Upper West Side’s exoskeletal rental building at 170 Amsterdam Avenue. 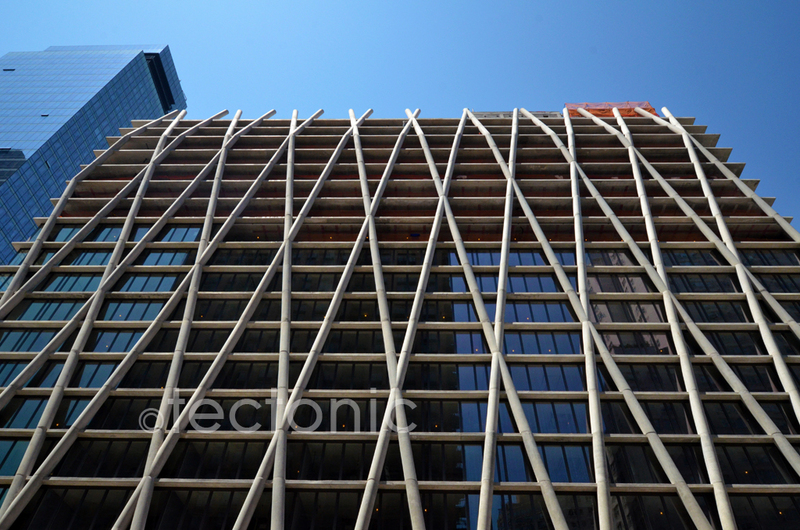 The 20-story mid-rise between 67th and 68th Streets will be the first residential building in the city to feature a concrete “diagrid” structural system. Developed by Chicago-based Equity Residential, the tower will house 239 luxury rental units and is slated to begin leasing early next year. Rental pricing may be similar to the Aire next door, where available units range from $3,375 for a 25th floor studio to $15,000 for a three-bedroom penthouse. According to the New York Post, Equity signed a 99-year lease for the site from the American Properties Group for $76.5 million back in 2011. The exoskeleton had many rough and discolored joints that have been recently sanded down and touched up a bit to give a more uniform look: it is a big improvement, but still looks a bit sloppy. Concrete form-work like that must be very challenging given all the different possible formulations, vibration requirements, curing times, and control of finish color and surface texture: good to see some cutting edge construction techniques being done on a large scale. ^ Interesting article but this is seriously fugly. Those cross beams/columns look awful from the inside. Just looks tacky and el-cheapo on the outside, imo. A cleaning nightmare? 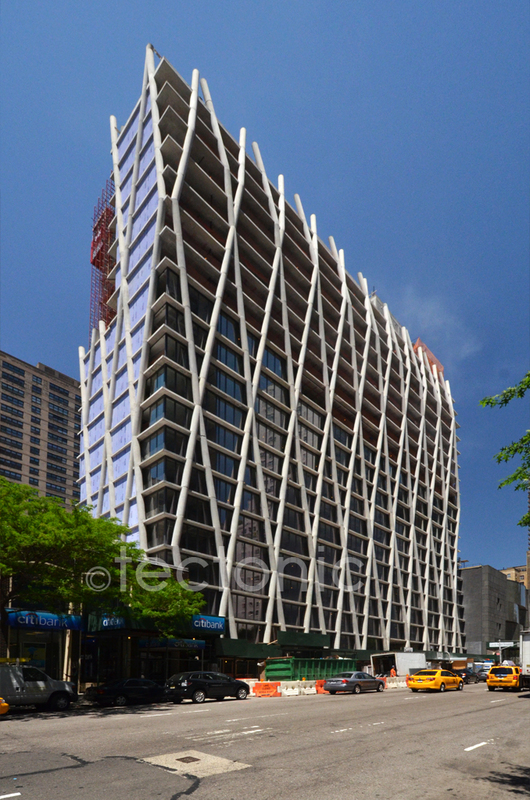 Apartments in the exoskeleton-clad 20-story building on Amsterdam Avenue and West 68th Street are now up for grabs. West Side Rag spotted the listings, and rents range from $3,375 for a 519-square-foot studio to $7,700 for a 1,281-square-foot two-bedroom. The bulk of the 239 units are studios and one-bedrooms, and available one-bedrooms currently start at $4,800 and top out at $4,960. The building's largest units—four three-bedrooms, measuring up to 1,500 square feet—have not yet listed. There are no interior renderings on the listings, and the brokerbabble is short on details, only say that units feature "floor-to-ceiling windows with cityscape views, wood flooring, quartz stone counters and stainless steel appliances." Equity Residential has a slew of floorplans on its website, showing that a couple apartments will have large private terraces or garden access. Building amenities (which are rendered) include a rooftop terrace, garden, fitness room, lounge, and playroom.